Basic site SEO takes very little skill, and just a little bit of time. You can pay an agency to overhaul your site, but there is a certain level of knowledge each site owner should have. Everything listed in this post is free, and most of these action items you can do yourself. Do your site a favor, and get started on the 6 (free!) SEO updates it needs in order to be found. You can’t improve what you don’t measure. Adding an Analytics program to your site means you can track the traffic to and on your site. What pages are people visiting? How long are they spending on each page? Where do they leave the site? Connect Google Analytics right now. It’s free, it’s fairly easy, and you need it. No excuses. This one is a little–but not too much–more technical than connecting Google Analytics. You’ll want to make sure that you verify all version of your site (https vs. http and www. Vs. non-www.) that are available, but specifically whichever version your traffic redirects to. Google Search Console will show you any problems that Google has indexing your site, including 404 errors (any pages that are really not there) and redirects. This is also where you would receive a message that your site has been penalized by Google, which is the only way other than a huge dip in traffic that you would know. Also, Search Console shows the actual keywords real searchers use on the Google Search Engine Results Page that result in ranked impressions for your site. This is a huge deal! These keywords show where you’re doing well with organic search-focused content, and where you need to improve. Coming up with interesting and search-friendly page titles can be difficult, but it’s not impossible. Make your page titles informative and include a keyword from the page. Don’t over-complicate it. Make each page title unique from other page titles. You probably want to build your brand into that structure as well. You know, for branding. These are the short write-ups that appear by your listing on the SERP. Individualize these per page. The search engine will pull a meta description that you set–most of the time. Sometimes, if Google finds good line in your site’s content that matches the searched keywords, they will use that instead of your programmed description. If you don’t set a description, the SERP will either pull the first 160 characters from your site content or a keyword-related bit. It’s best not to leave this to chance. Set your unique description that includes the keywords you want to focus on and a call to action. Image titles and alt tags were first implemented for accessibility: they allowed folks who can’t see the images on your pages gain information about those images. If your images don’t load or the user is visually impaired, this is really helpful. Turns out, search engine crawlers and indexers are also visually impaired, at least when it comes to images. A robot doesn’t see images like we do, so tagging those images with keywords gives the search engines more information about them. 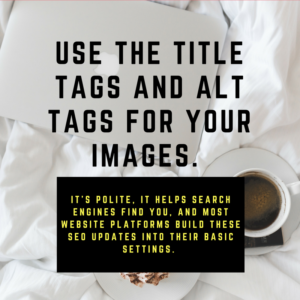 By indexing image data from title and alt tags, the search engine is able to better understand the page content, and therefore show you better results. Use the title tags and alt tags for your images. It’s polite, it helps search engines find you, and most website platforms build these SEO updates into their basic settings. While you’re at it, you can probably optimize your images before uploading. You can use a free tool like ImageOptim, which will compress and strip out a lot of metadata on your images, meaning they (and your pages as a result) will load faster. The biggest mistake any site can make is to avoid or ignore writing good, up to date content. Search engines pride themselves on helping people find the best information. The best information generally comes from sources that are constantly updating. This doesn’t mean you have to rewrite your landing pages every week, but it does mean that your site should have some place where new content is being shared consistently. This means you should probably be blogging. Sharing on social media is ok, but the search engines can’t sift through all of that information. They can, however, index your site periodically and see when a blog is growing. All content on your pages should be keyword-focused, from landing pages to blog posts, but all of it should be readable to the human eye. Make sure your words look like a human person put them together, and you’re more likely to get human people to read them. The easiest of SEO updates for you to gain local attention on your site comes in the form of making sure your store can be found: adding your address to the page content. Put your address on your contact page and your home page. Put specific keywords into your landing page content that locate your services to the city and neighborhood you’re targeting. Take the time to make these changes. Depending on the size of the site, it could take only a few hours, but you’ll have a good baseline to do some more focused work later. And you’ll have the tools to analyze your progress!